As many of you are aware, I absolutely LOVE to travel. This is one reason why I have chosen to eat so well. There are just too many spectacular places on this earth to encounter in one lifetime. I do not have the time to get sick. I want to remain healthy and energetic for as long as I can so that I can experience all the wonders of this beautiful world. Last Thursday I had the opportunity to accompany my husband to Shanghai for the weekend. Yes, the weekend. I know it’s a long flight (14 hours) and my time there not as long as I would like, but I gladly accepted the offer. Seeing the world in short spurts will suffice for now. During my short stay, I fell in love with Chinese Noodle Soup. Actually, I became addicted to this meal and had it for breakfast and dinner on all 3 days. When I returned home, I was to sure to stop by the grocery store for its ingredients. I wanted to share this simple, warming, and aromatic dish with my children. Their reaction – “Mom you should make this more often!!”. I think I might just do that. Heat sesame oil over medium heat. Stirring constantly, cook garlic and ginger for about 2 minutes. Add vegetable broth, mushrooms, tofu, and bok choy. Heat to boiling, then let simmer for 5 minutes. In a large soup bowl, add cooked rice noodles. Ladle broth and vegetables into bowl over noodles. Add a handful of bean sprouts to bowl and stir soup. Add a dash or two of soya sauce if desired. * China is the world’s largest edible mushroom producer. A bowl of noodle soup in Shanghai contains such a vast array of mixed mushrooms (shitake, tree oyster, chanterelle, and black trumpets, just to name a few – some of which I had never had the pleasure of tasting until this visit. Try not to settle for white button mushrooms. I found a wonderful bag of locally grown assorted dried mushrooms in a nearby natural food store. What a wonderful flavour it brought to this soup! This entry was posted in Meals, Soups and Salads and tagged gluten-free, mushrooms, nutritious food, recipes, rice noodles, soup, tofu, vegan on December 13, 2012 by uberdish. When you make this one, you may want to play a little Adele and pour yourself a good glass of Shiraz. It takes a little time, but is so worth it! I made this dish last Sunday evening for some carnivorous family members. They left my house with a smile and a very full belly! Saute onion in coconut oil and set aside. Mash cooked potatoes with butter, milk, salt and garlic in a mixing bowl. Set aside. Wipe mushrooms clean with a paper towel and place on a baking sheet. Lightly drizzle some wine on the baking sheet and over the mushrooms. 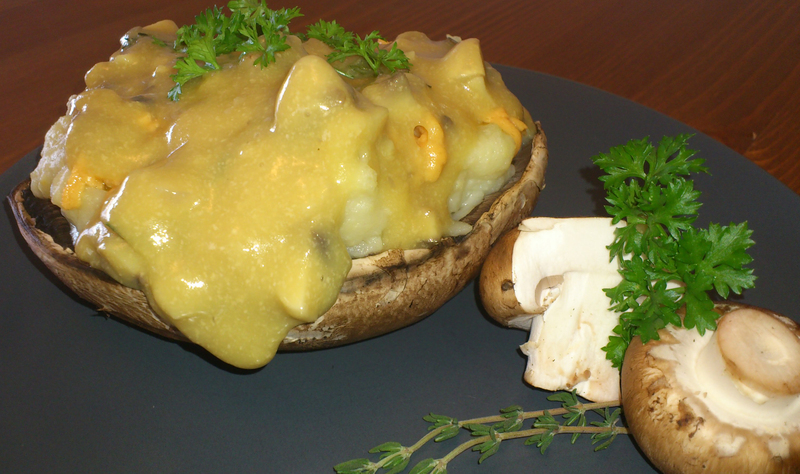 Top mushrooms with cheese, mashed potato and sauteed onions. Bake at 400 degrees Faranheit for about 10 minutes. Garnish with parsley and fresh pepper. Serve with mushroom gravy, a mixed green salad or squash soup. *Instead of potatoes, try mashed squash! Steam fry mushrooms until brown and tender. Set aside. In a sauce pan over high heat, stir arrowroot flour and nutritional yeast flakes until it smells toasty. (At this point, do not get distracted and pour yourself another glass of Shiraz!). Whisk in water, wine, soy sauce, salt and thyme. Stir gravy constantly until it thickens and begins to boil. Reduce heat and simmer for 2-5 minutes. Pour over cooked mushroom caps and add chopped parsley or thyme leaves for garnish. *Nutritional yeast is a yellow inactive yeast with a nutty cheesy flavour. It is a good source of protein and B complex vitamins. Try sprinkling some nutritional yeast over hot popcorn or pasta for that cheesy flavour. This entry was posted in Meals and tagged food, gluten-free, gravy, mashed potato, mushrooms, nutritional yeast, portobello mushrooms, recipes, vegan on October 26, 2012 by uberdish.